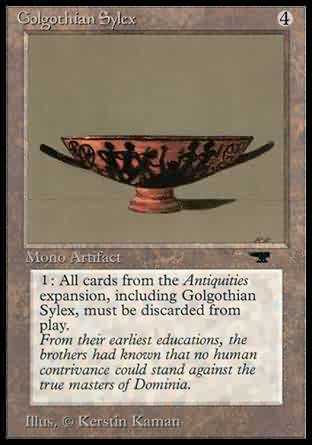 1: All cards from the Antiquities expansion, including Golgothian Sylex, must be discarded from play. 1, T Destroy all cards from the Antiquities expansion. From their earliest educations, the brothers had known that no human contrivance could stand against the true masters of Dominia.